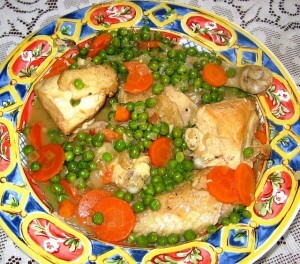 Chicken Classic recipe by Nazia Nazar at DesiRecipes.com. Wash, clean and cut the chicken into medium size pieces. Mix it with the vinegar , soy sauce, corn flour, egg, black pepper , salt and mustard powder. Marinate for two hours. Deep fry the marinated chicken pieces taking care not to stick each other and keep aside. In a sauce pan heat oil, add curry leaves and ginger /garlic paste and fry till light brown. Now add red chilli paste and tomatoes, when cooked add the tomato sauce, chopped ginger and fried chicken pieces. Mix well, cover the pan and cook for 15 minutes on very low flame. Meanwhile, heat 1 tsp oil in a frying pan and lightly fry the green peas , sprinkle a pinch of salt and keep aside. Now dish out the chicken in a shallow bowl. place the green peas all around the chicken (should not be over the chicken ). Garnish with curry leaves at one corner, green chillies at another and lemon wedges at third corner. Sprinkle julienned ginger followed by chopped coriander leaves over the centre part of the chicken .